The summer break is quickly winding down and it's time to start thinking about school again. I remember always having a lot of mixed feelings this time of year. 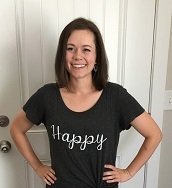 I was always sad that summer was over- no more late nights outside or water fights or swimming or barbecues; but I was also excited to meet my new teacher(s) and see what my classes would be like. I never thought about the teachers when I was younger, but then I became one and realized they have very similar emotions when it's time for school to start up again ;). Teachers do so much- there are hours required outside of their contract work hours in order to prepare lesson plans, prep activities, make copies, grade papers, collaborate with other teachers, etc. Being a teacher is a busy job- but a very important one. Kids are so impressionable, and they can have such a strong desire to learn, if that desire is utilized. I know that my favorite teachers were always the ones that really delved into the job. They didn't do the bare minimum- they went above and beyond to make the learning experience enjoyable and to help prepare their students for the future. 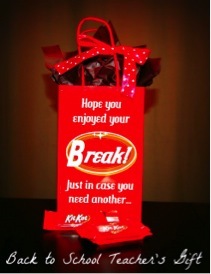 It's these kind of teachers especially that make the back-to-school week bearable! Make a jar of cookies with a note attached: "I'm going to be one smart cookie with you as my teacher!" Put together a small pedicure set (nail polish and file for example) with the note: "Let's start off on the right foot- thanks for being my teacher!" 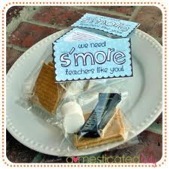 Give a little baggie of marshmallows, chocolate and graham crackers with a note that says "We need s'more teachers like you!" 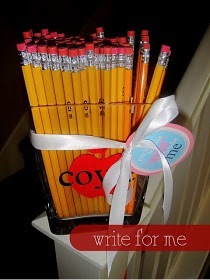 You could give a variety of candies with cute little sayings- "We will have mounds of fun being in your class! "; "I am jumping for joy (Almond Joy) to be in your class"; "The fun this year will be good n' plenty! "; "I'm glad you'll be teaching me all bout whatchamacalits this year!" "You were mint to be my teacher (York Peppermint Patties). You could even just throw a whole bunch in a jar or cute baggie for a very chocolatey gift- which, let's be honest- we all have those days when we just need a little chocolate to keep us going ;). There are a lot of options when it comes to candy bars! Find some good-smelling lotion and write a note: "I hope you have a smooth year!" 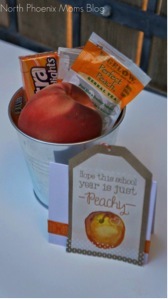 Give a themed gift, such as a gift basket of peach-flavored goodies and say "I hope this school year is just peachy!" You can also give teachers school supplies. I know when I was a teacher I could never get enough art and craft materials. And I was almost as giddy as a little kid at Christmas when I received new books or stickers! You could get creative and add fun little notes like "I'm glad we get to 'stick' with you this year" or "I can't wait to see how this chapter of school unfolds" (Feel free to be as cheesy as you want;) ). You could even combine a few of these ideas to make a 'teacher's survival kit', including school supplies, books, and chocolate ;). Hopefully this got you brainstorming on some fun ways you can show appreciation to the teachers and other school employees around you! Good luck with the school year!